Beyond Baked » The under 150 calorie, gluten-free, paleo , vegan wrap! 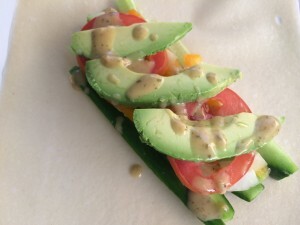 Home Blog The under 150 calorie, gluten-free, paleo , vegan wrap! 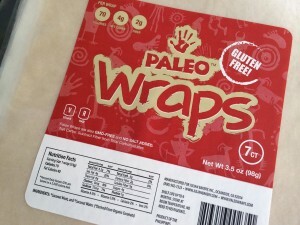 I don’t normally buy pre packaged gluten free foods, but I really like these paleo wraps from Julian bakery. They are not cheap but they hold up well and the coconut taste is very light. Also they can be stored on the shelf and they keep for months! I am estimating the calories in the veggies to be about 50 and there are 70 calories in the wrap. That’s only 120 calories. OR you can shortcut that with a store bought pre-made green curry sauce. Look at the ingredients and go with the most natural one you can find. Don’t be afraid to change out the fresh veggies with whatever you happen to have at your house. If you eat meat you can add some pastured chicken to it, but it is quite tasty without it. Optional: 1 tablespoon green curry sauce or dressing of choice. Place everything in the middle and wrap it up like a burrito. It can be messy , but once you do it a few times you’ll get it. Now go on and enjoy, maybe even have two!